A robotic spacecraft circling Mars has snapped the first image of a series of active avalanches near the planet's north pole, scientists said Monday. 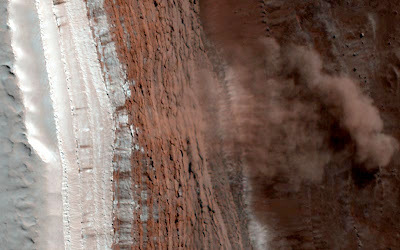 It is rare for scientists to catch a natural event in action on the surface of Mars. Most of the landscape that has been recorded so far has not changed much in millions of years. The avalanches occurred near the north pole and broke part of a 2,300-foot cliff. Scientists were unsure what set off the avalanches and whether they occur frequently or only during the spring. "Scientists were unsure what set off the avalanches..."